Shirahama fireworks festival – – The rainy season was over today! Today, on July 19th Saturday the fireworks festival took a place in Shirahama. 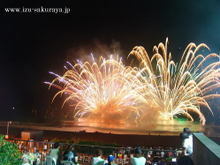 Every July the fireworks festival is held on Shirahama Ohama beach. And it started at 8:00 pm today. It was so exciting because the fireworks were held in front of the beach and we can see it over here. By the way the weathere forcast said that the rainy season was over today in Tokai area….. It was very hot and humid in Shirahama today. I took this picture before going to Shimoda for shopping. It was a first time to see a lot of people on the beach this summer. 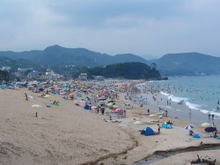 During next 40 days a lot of people come to Shimoda to get a real summer. This entry was posted in 未分類 on 2008年7月19日 by izusakuraya.